I’ve decided a few weeks ago that I will start writing about notable changes within the park and share them here. This entry will be feature changes from early September 2011. The large middle section of the entrance gateway is under refurbishment… something like that. 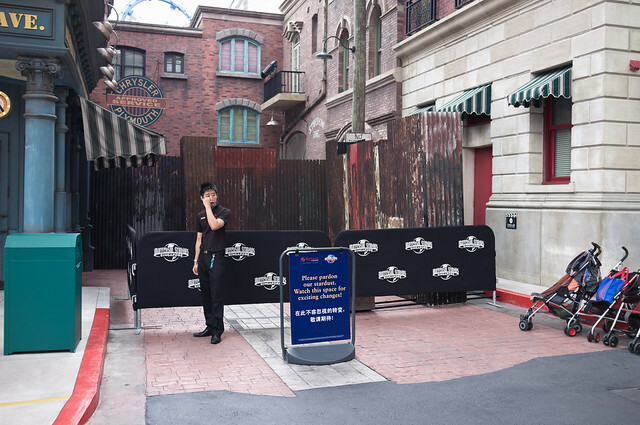 The middle gate has been blocked off completely, so those without tickets can no longer lean on the silver fences and stare into the park. Also, it looks like they have changed the fences – they look a lot taller, especially the ones in the middle. 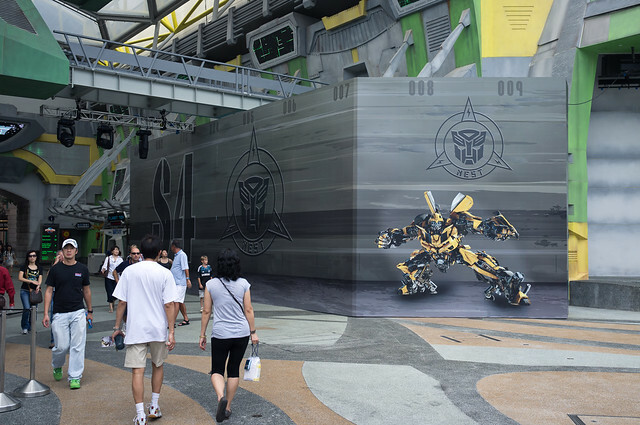 Not sure if this has anything to do with The New Paper Big Walk in a month’s time which includes a stroll around Universal Studios Singapore. 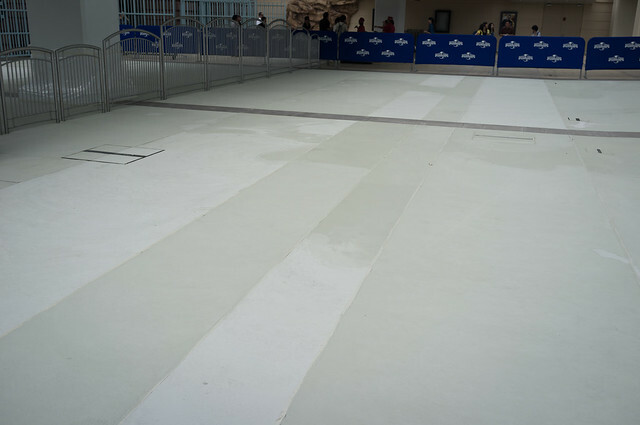 The last time the park did floor repairs was for the Standard Chartered Marathon a year ago. Yep, the ride has been down for rehab for two months now and the ride is sealed off. From Canopy Flyer I could see that they cleaned up most of the river and most of the boats have been left to sit outdoors behind the Waterworld queue zone. 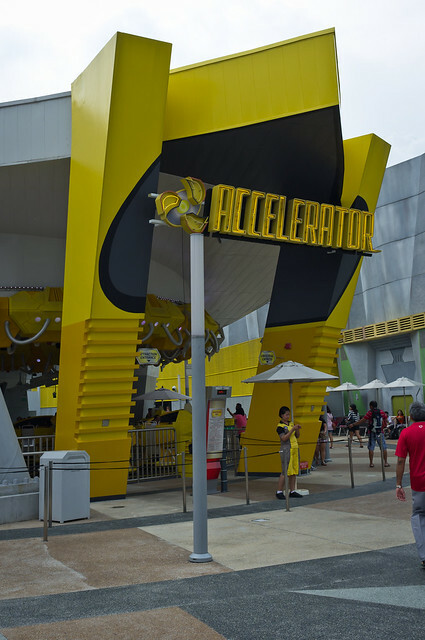 The entrance to the Accelerator has been given a bright paint job to resemble its yellow pods. 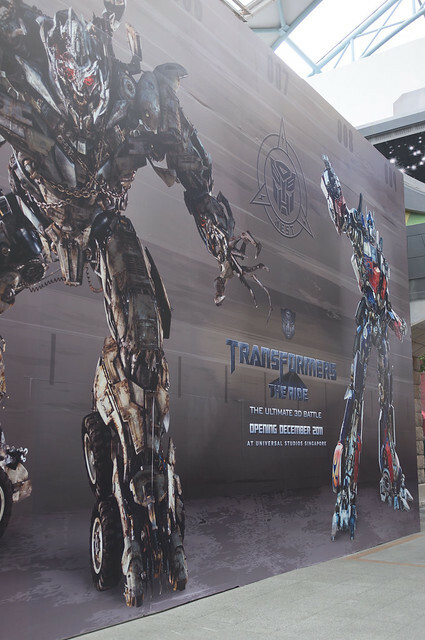 The latest design for the temporary Transformers façade. This is the 3rd/4th version? 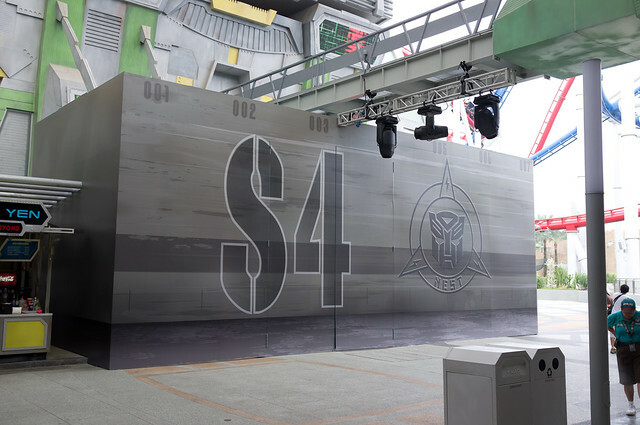 One of the inanimate “store displays” at Sci-Fi City has been blocked off for modification / construction. They also seem to be installing lights all over the park for Halloween Horror Nights. Also, The new restaurant at Sci-Fi City (adjacent to Transformers) has been cleaned up and looks ready to open. 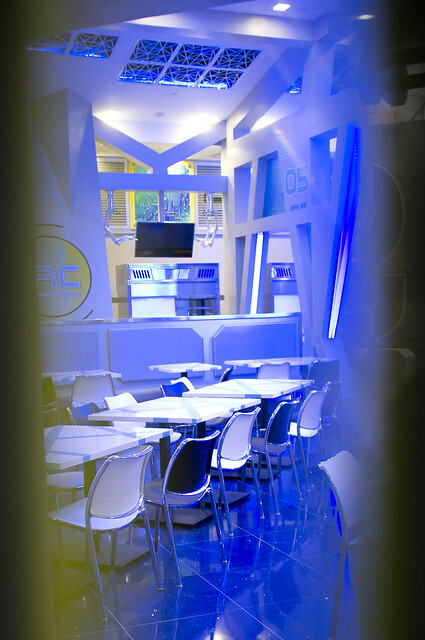 I wonder how the blue lighting is going to do with the presentation of food there. In fact, I’m even more curious as to what they will serve here. 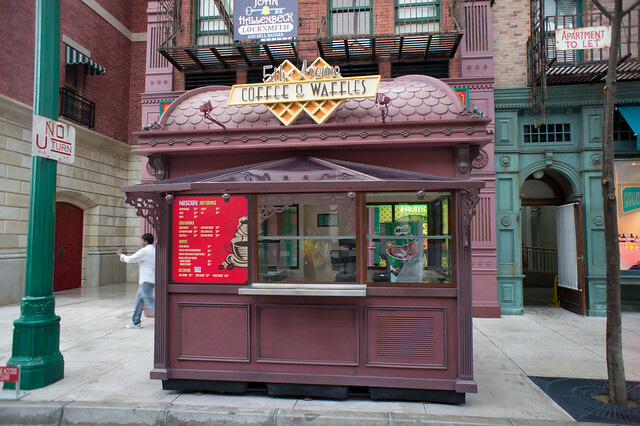 Hopefully not like the Comet Café in Tomorrowland at Hong Kong Disneyland! 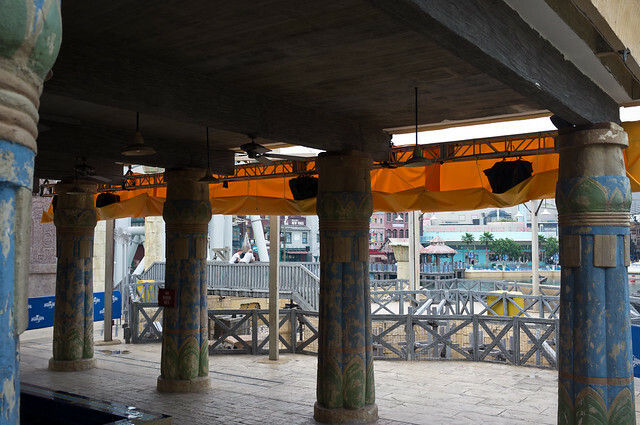 The roof for the outdoor seating area for Oasis Spice Cafe has been repaired (one side actually had an entire slab missing months ago) and some lighting structure has been installed. Could this be the one part of the scare zone in Ancient Egypt? For fans of Revenge of the Mummy, Imhotep’s head at the launch hill now remains lit all the time (instead of only being lit when the train reaches the middle of the hill) which somewhat ruins the “surprise” launch hill. Back when the entire section was dark, I’ve often observed overly-excited people screaming that the train would be going DOWN at that point. Anyway, the scene before the final drop is finally repaired – with the sliding wall and Book prop working like they’re supposed to! 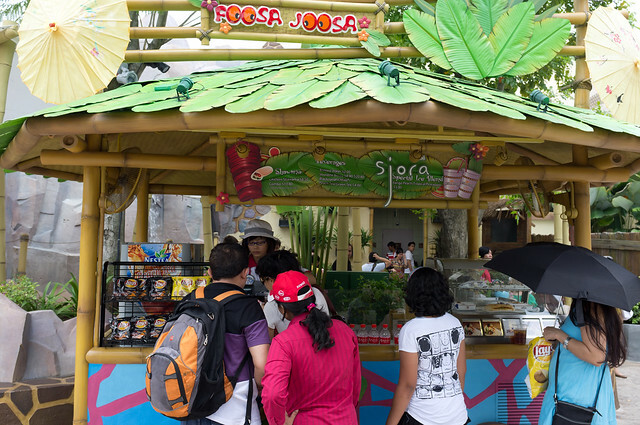 Foosa Joosa (Madagascar) has been open for business for a few weeks now. The stall offers Sharwama and Sjora Ice Blend drinks. Marilyn’s (Hollywood) is still not open (been here since August already!) Great for fans of the Universal Studios’ famous Roasted Turkey Legs who are too lazy to walk all the way to Far Far Away or Jurassic Park for them. 5th Avenue Coffee & Waffles (New York) is sadly still not open after 2 months. 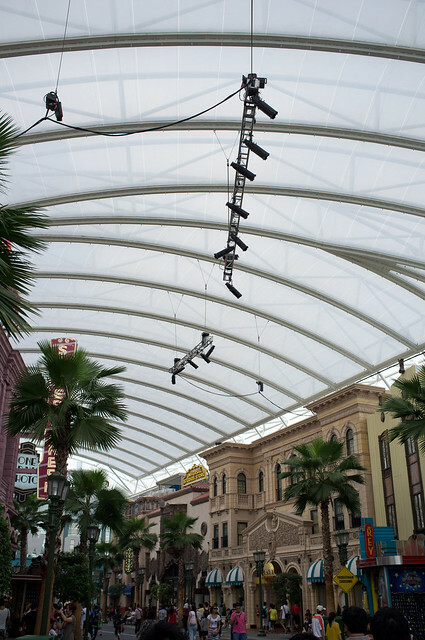 With two more weeks to go, the park is starting to get ready for Halloween Horror Nights. The event trailer can be seen playing on many video screens all over the park. 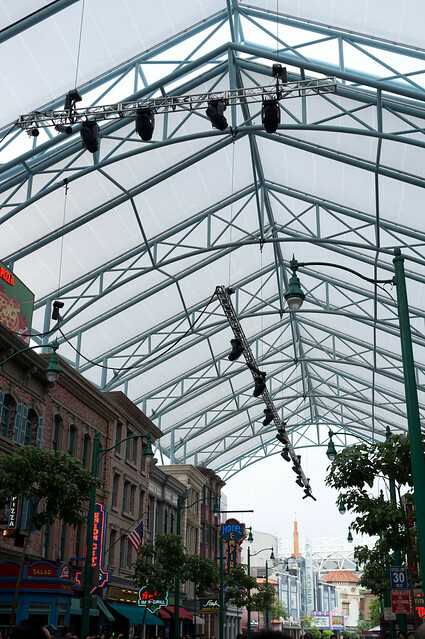 Water Street at New York has been blocked off for the construction of Sting Alley, a scare-zone for Halloween Horror Nights. 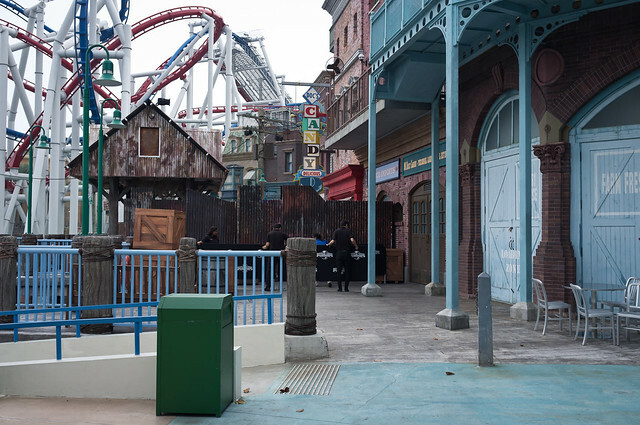 This is not a free-roaming scare zone, it has been confirmed that guests will need to queue to enter Sting Alley (even Halloween Horror Nights Express is offered here), probably because of how enclosed the street is. The other end of Water Street (and the New York Lagoon area) has also been blocked off. So for those who love to take the Lagoon path to Sci-Fi City/Ancient Egypt, do note that this shortcut cannot be used for the entire month of October. 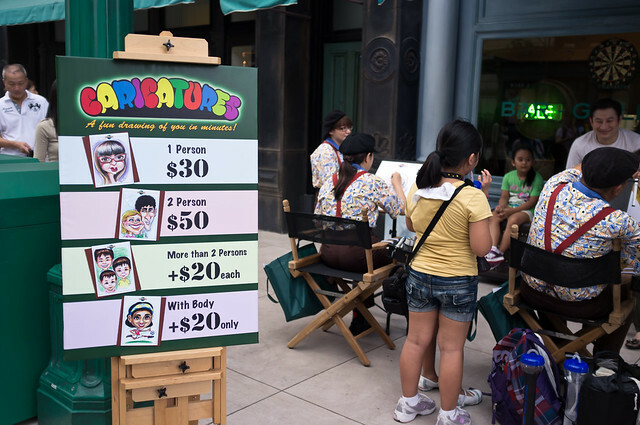 This is not the main attraction for Halloween Horror Nights. The large haunted house is known as The Peranakan Mansion and will be built inside one of the soundstages – stay tuned for more information! 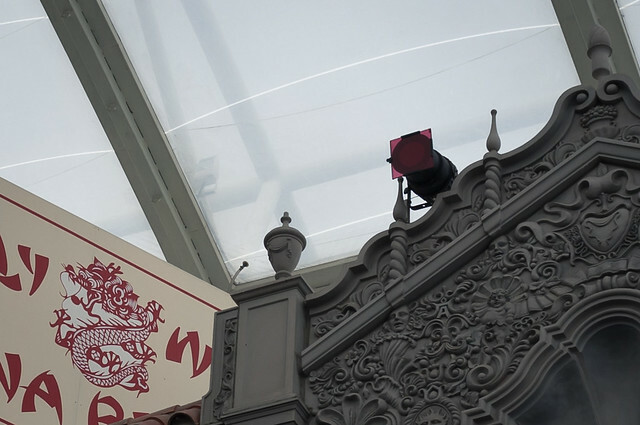 Lighting equipment has been spotted all over New York and Hollywood. Some building facades at Hollywood have colour gels installed too. For more information about Halloween Horror Nights, refer to this this post. The park is trying to get guests to upgrade to Annual Passes. Almost all crew members wear a large pin, with Woody Woodpecker, that says “Ask me about the Annual Pass upgrade!” I guess it’s working – I saw a large crowd at the Annual Pass Office during the afternoon. 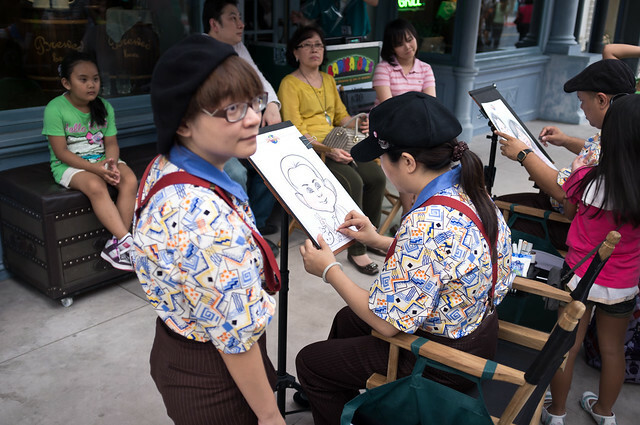 Interestingly, the New York has a new attraction: Caricature artists! 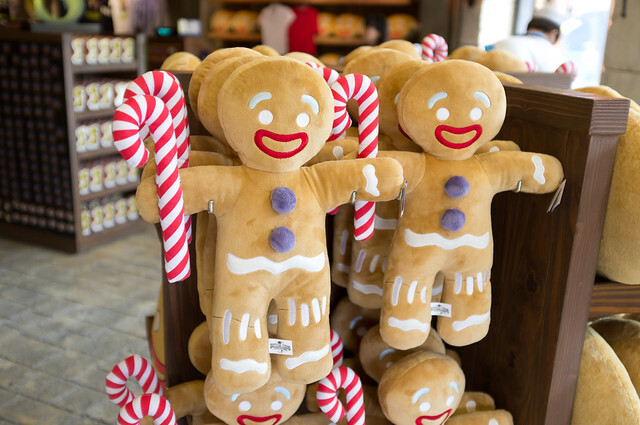 You might be interested to know that this is the latest variant of the popular Gingy plush toy. 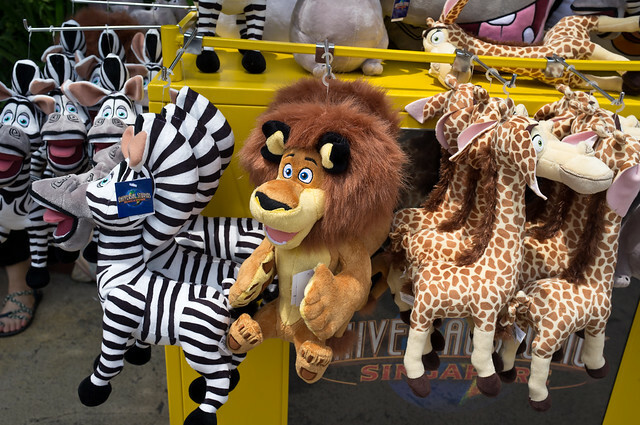 They have finally completed the “Circle of Life” at Madagascar with the Alex plush toy! The Morty plush toy is also available. The New York Library has new banners installed which features some park zones (The “Dreamworks” banner is not shown here). New flashy signage for That’s a Wrap. The old one (which is very small and in green) was just too easy to miss. 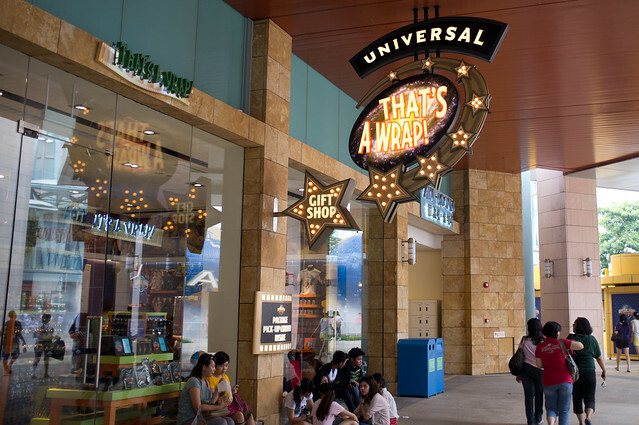 This is where guests can send merchandise purchased in the park to conveniently pick up upon exit. It was a crowded weekend at the park but surprisingly queues for most attractions (except Canopy Flyer) are below 20 minutes. Most guests are walking around or resting in restaurants instead of going on outdoor rides due to weather – blistering hot (and recently hazy) as always. Yep, so that’s about it for now. The next update will be posted before Halloween Horror Nights (or after its first night), so do check back in two weeks! Other note: I will be writing a series of entries, or guides, pertaining to attractions and (often requested!) food in the park. 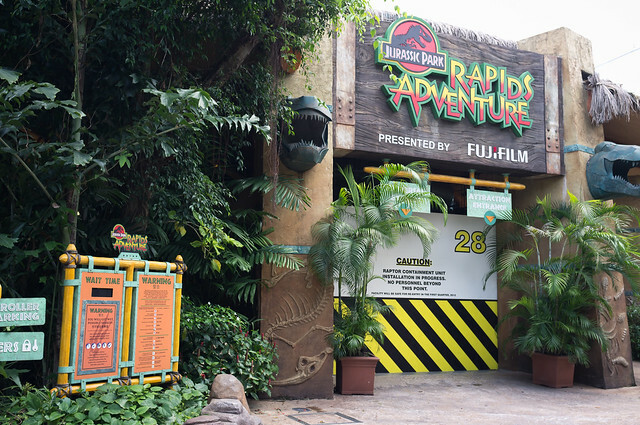 The attractions post (which will take longer to produce) will talk about the story of each attraction, detailed descriptions of each scene and maybe some notable facts or technical information. The food posts will feature menus (and prices) which would help readers to plan out a food budget or find something unique to try – as we all know, meals in theme parks aren’t cheap or exactly fantastic all the time – so I wish to help out in that aspect. Research for these posts are underway and I hope to post the first Food guide in Late November. OMG….. 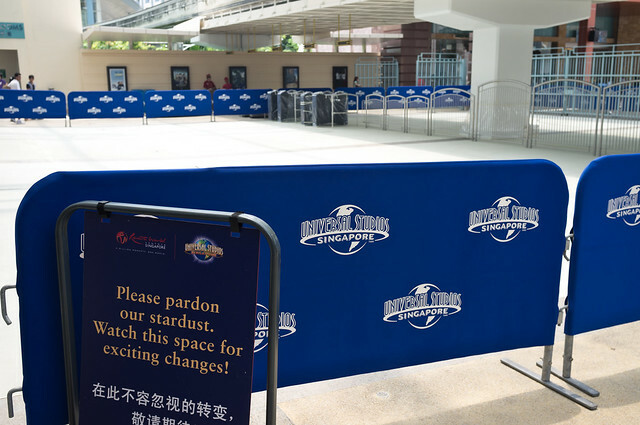 I go to USS every weekend just to see these little changes around park too! Now I just wonder when will the restaurant be ready. 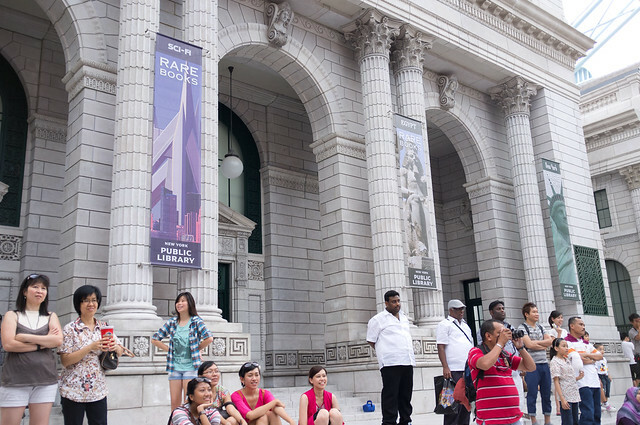 If you see anything interesting during your visits, do let me know! About the Sci-Fi City restaurant.. .Well, the staff in the park are not allowed to comment on anything that’s not officially announced. I can only say that it will open only after October. thr’s an eatery coming up. it’s call starbot cafe i think.